The sun begins its descent in the spring sky. On a desolate block of Sunset Boulevard, tumbleweed bounces lazily across the road, dust dances in tiny tornadoes swirling from abandoned lots, the temperature sizzles and heat waves rise like candle vapors. My throat’s parched, coated with grit. 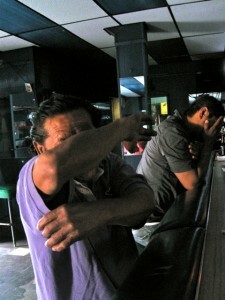 I need relief from the scorching heat and dream of a cerveza. Like an apparition, what looks like a bar beckons me. I park and see the sign El Chubasco and OPEN. I walk in. It’s 5:30 as I head over to El Chubasco. Easy parking, the street’s dead. Flies in the doorway scatter as I walk in to see a dark, sparsely populated square bar, men staring at their cellphones. As I take a corner stool, eyes shift to me, then back to their phones. They’re grim. The big bearded guy with the stone face, to my right, looks mucho annoyed. The old man to his right studies his beer. Intensely. Ok, so I’m a bit of a fish out of water but I’m sticking with it. The barmaid does her job and asks what I’ll have. A Corona. Want a lime? No thanks. Oh, can I have a glass with that, please? She goes to the battered fridge, retrieves a glass and tenderly wipes it off with a napkin. Is this their only glass? I’m the only one pouring beer in a glass. Oh, gringo, why’d you do that? A guy down the bar is putting salt on his Modelo can. 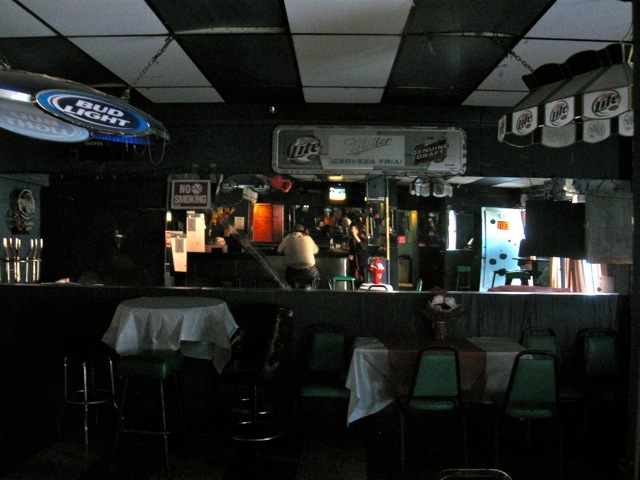 The decor is the epitome of dive bar minimalist, tattered brown fabric curtains hang sadly in the doorways, the worn tile floor has seen its day, the lights mercifully low. Behind the bar, a few packages of Doritos hang desolately on clips, signs announcing all sorts of rules are tacked to the back wall, their health department “B”. Two old tv’s are on different channels. One sports, the other some show with girls in kilts flying around in a boxing ring, hitting old guys with feather pillows. Sidebar: I had heard, years ago, that call girls could do that for a living and, considering how much money they made, didn’t think it was such a bad idea. But that was years ago! So, I take out my camera and I ask the barmaid if it’s alright to take a picture. She looks at me hard and then asks the old man at the end of the bar. All conversation is in Spanish. He looks over and vigorously shakes his head, no no no. I’m puzzled. Why not? Just no no no. Now everyone is looking at me. One man slides off his stool and quietly checks out of the bar. Ok, taking out my camera was clearly a mistake. The cloud is burning off my brain. They probably think I’m from immigration. All of a sudden, an earsplitting peal of trumpets nearly blasts me out of my seat as the juke box fires up and Mexican music fills the air. Ah, the Corona tastes good, even if it’s in a glass. The grizzled little guy to my left, looks at me askance, suspicious, speaks English. Sort of. Asks me if I’m a reporter. I am taking notes. How the hell else am I going to remember all of this? I tell him no. He asks again. Again, “no”. But he starts chattering away anyway still eyeing me with wariness. Jesús (HEY zeus), can I take your picture? Grimacing, he strikes his best Bruce Lee pose and tells me Lee is dead. His phone rings and he jumps off his stool to politely take his call. He’s two feet tall. Roland moves over to Jesús’s stool. My god, this guy has more hair than Gavin Newsom and a face worthy of Rushmore with lines so deeply chiseled he can hide his weed in there (if he had any). He speaks with his eyes half closed that gives him the aura of a deep thinker or maybe someone who can’t find his glasses. I’m pretty sure he’s had a few before I got here. Roland tells me everyone was freaked out when I came in and asks if I’m a writer? Do I write books? On the tube, there’s a tiny girl, with a huge voice, singing the national anthem for the opening of the basketball game. Everyone is transfixed. 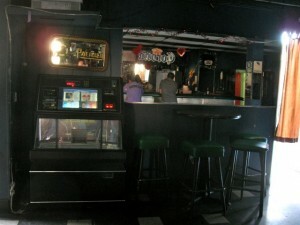 Except Roland, who seems oblivious and wanders over to the jukebox. The sudden blast of music while this girl is singing amuses the barflys and even the grouch next to me finally smiles. I’m winding down but Roland comes back and insists on buying me a beer. I can’t refuse. Veronica, the barmaid, cracks open the bottle and Roland peels off a Benjamin. That’s impressive. Veronica warms up and smiles for the first time. She really is a fireplug, short and squat with a plunging neckline and massive cleavage and, yes, they’re REAL. Apparently, the manager is still deeply suspicious of me and asks, through Veronica, if I want to see his bar license. I shake ‘no’. He’s adamant everything’s on the up and up. Who speaks English? Please tell him I’m not a police officer, not from immigration, not from the health department. My translator says everyone is suspicious of a white person in the bar. White people don’t come in here. I offer to buy Jesús a beer. He eagerly says ‘yes’ but the manager firmly puts the kibosh on it signalling he’s had enough. Jesús looks dejected. Roland wanders away again to talk to someone else. New man, Nery, appears on the stool to my right. Nice white shirt, pressed pants, clearly a businessman. Used to be a truck driver til he discovered 4Life, quit his job and now he’s sure he’s on his way to making $36,000 a month! 4Life is a multi-level marketing product, some might call it a scam, but Nery says the products cured his friend’s cancer. He offers to hook me up if I want to be a seller. I’ll think about it, I say. Oh, by the way, the old guy is the owner, not the manager, Nery offers. That’s interesting. I have to think about this. So, the ‘manager’ didn’t want me to know he was the ‘owner’, because if something was wrong, I might have ‘arrested’ the ‘owner’, but not the ‘manager’. Convoluted, I know, but food for thought. Nery – no, it’s not a nickname he assures me – casually tells me I look like a cop. What?! Me? I look like a cop? Yeah, you look like an actress on one of those tv shows…she plays a cop, so you look like a cop. Is this what multi-level marketing does to your mind? He whispers, you’re perfect, you’re pretty. I quickly down my Corona, pay my bill and thank everyone for not running away. They’re relaxed enough to laugh and I leave enlightened. Not by multi-level marketing but by our cultural landscape and how that plays out everyday in every way. Through the shabby curtain, I’m back out on Sunset. On the steps beside the bar sits a zoned out drunk, bottle in a paper bag, pants wet with booze. Got a story about your bar adventures? Do share. We’d love to hear from you! Oh man this is pretty damn funny…. I met you today at Mowhawk (the guy to your right ) you were impressed by the 209 gin. 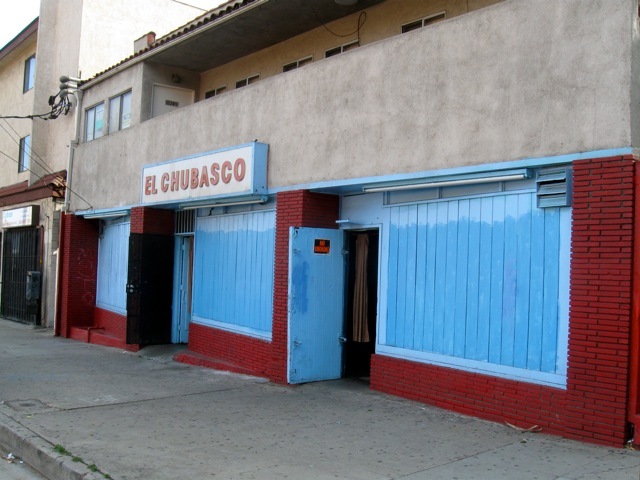 El Chubasco is one of my favorite places in all of LA. It may be hard to understand the charm of this place especially if everyone in the bar thinks your a cop. Under normal circumstances which unfortunately because of your caucasianess you may never get to experience the people are quite lovely. It’s like walking onto a David Lynch movie set except it’s for real. Yeah that 209 gin was WOW! Catch up with you on the trail somewhere….